Starbucks got pretty fun yesterday. A few of us pulled out the ear-buds and acted like real people, trading jokes, stories, and turns watching laptops. It was pretty awesome. It filled a need in my heart for community–something I feared I was sacrificing when I decided not to attend grad school in Virginia. And after I had returned home, Sister Kate showed up. We went for an unexpected walk, catching up in about twenty minutes. All of it strengthens me. And I needed some strengthening. Last night I also attended a Good Friday service. Contrary to the somber affairs I had been accustomed to, this one was lively. It was full of upbeat music and positive thoughts–focusing on the glorious words, “It is finished.” Rescued. Christ’s death rescued me. Living a story full of heartbreak, thrill, adventure, danger, and success that would make a novel jealous, I am fully grateful for that rescue. Christ is my knight in shining armor. The One Who says I never have to be alone. Hallelujah. Let me preface this blog post with the comment that I am not just in Virginia to play with a newborn and love on my friend (though those are good parts of this trip). I titled my desire to leave Maine behind for a few weeks “walk-about”, not because I would actually be walking much, but because the concept of “walk-about” is soul-searching and place-finding and self-discovery and, importantly for me, listening to God’s Voice as I process my past, deal with my present, and plan for my future. So if I sound a bit melodramatic in this rather lengthy post, know (1) that it is because I have been thinking a bit more than is perhaps normal and (2) that my melodramatic side is already fading. During my time in Virginia I have been re-reading my favorite series: The Chronicles of Prydain, by Lloyd Alexander. They are the tales of the life of a very ordinary Assistant Pig Keeper (Taran) making mistakes and discovering life. Alexander has a unique ability to offer books full of rich moral lessons paired with fast action and loveable characters. He is the author I have learned the most from in my journey as a writer and a person. As an introduction to The Book Of Three, Alexander writes, “Our capabilities seldom match our aspirations, and we are often woefully unprepared. To this extent, we are all Assistant Pig-Keepers at heart.” In all honesty, I have been feeling much like an Assistant Pig-Keeper completely outmatched by the vastness of life. And I mimic Taran’s words, “At home nothing ever happened. Now, everything happens. But somehow I can never seem to make it come out right.” This latest journey, and indeed much of my last couple of months, appear to ‘never come out right’ by my own doing. There are some bittersweet moments for Taran, our young Assistant Pig-Keeper. At the end of his first adventure he says, “And I am troubled, for I wonder now if I am to be a stranger in my own home.” I guess I am somewhere in the middle of my latest adventure, somehow still pining for home and longing for a change simultaneously, unsure of myself and my own judgment, not at home at home and not at home away. There is comfort in the advice of Adaon in The Black Cauldron, “I have marched in many a battle host, but I have also planted seeds and reaped harvests with my own hands. And I have learned that there is greater honor in a field well plowed than in a field steeped with blood.” So through prayer and discovery and some bumps and bruises I have learned a bit more that both tasks (steady work at home and the labor of adventuring) have an importance place in my life. Each offers challenges and victories that should not be overlooked, leaving me with discoveries and memories I would not go without. I think part of my frustration is that I have been trying to find a home in one or the other. Now I think I see that it is the plowing and the adventuring together in which I find the direction of my life flowing. It is a unique life, full of challenges and misunderstandings on my part, but that does not make it any less right or wonderful for me. So, no, walk-about has not showed me exactly where life is going, but it may have made me a bit more receptive to the concept that difficulty does not deplete the worth of something; it may, in fact, enhance it. Signing up for a life that is daunting is so much better than cowering in the shadows. Oh I do love the open road. Nevertheless, my brain was the consistency of jello when I finally made it to New York. It was not today’s drive that killed me. It was the drive to and from New York on Tuesday, followed by this drive, that nearly sucked all my capacity for logical thought away. So, like any sane person, as I ransacked my sister Julie’s cabinets for food I settled on chocolate chip pancakes. They may not have been the best choice for food to follow up the three cups of coffee (one was decaf) I had tapped into on the drive, but oh they were good! Listening to sermons in the car is a great way to pass the time, learn some good things, and keep your mind in a solid place. There is no telling what big thoughts will pop into a person’s head as they sit all alone in a car… My pastor’s sermons are all online and I downloaded several onto my iPod before leaving home, along with a new CD to keep me company. So, with less near-death experiences than I usually face on a short drive in Bangor (we Mainers are crazy drivers), I made it to Nyack, New York in one piece. Tomorrow: Virginia. This weekend Maine Bible Quizzing hosted its District Finals tournament. At it, the teens compete to see who goes on to the Regional tournament. Some of the kids who got busy and dropped out of the program return and at the end of the evening have a banquet (which for some of our homeschooling seniors is about as close to prom as they can get). So this was not a tournament I could miss. Yet I had conflicted dates. Sunday at 1:30 my friend was having a bridal shower in Virginia—fourteen hours away. I settled on staying at the quiz until 3ish and then heading to New York. Sunday morning I got up and drove the rest of the way to the bridal shower, arriving a whole ten minutes early. I am really glad I made those arrangements. I would not have wanted to miss the quiz. The youth were so much fun. I was an official, working with an old rival and friend–Scott. From Veggie Tale questions to Disney questions together we tried to make the time when the kids were not competing as much fun as possible. 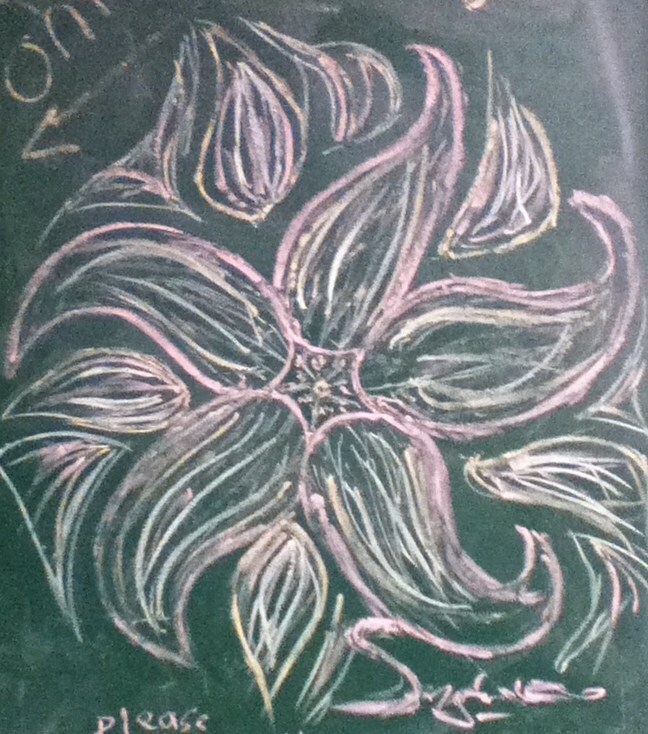 What came out of it was this gorgeous flower chalk drawing (I do not know who to give credit to, but it was one of the teens) that is reminiscent of the one in Disney’s Tangled. Props to whoever is responsible. But as much fun as all that was it paled in comparison to the worship times we had. Usually I lead a singing time on Friday night with my guitar. This quiz we squeezed in two additional opportunities for the kids to worship in song. The last one was at lunch time. I pulled out my guitar and started playing. Instantly, the youth started to move in around me. Though they only have 40-ish minutes for lunch, they spent more than half of it in praise of God. To hear their voices willingly raised in worship of the Creator was incredible!